on January 25, which was recently declared “No Name Calling Day” by Governor Deval Patrick. UPTON — As part of the state’s initiative to cut down bullying in public schools, Governor Deval Patrick recently declared January 25 “No Name Calling Day” in Massachusetts. Blackstone Valley Tech celebrated the day by unveiling a student designed ad campaign to inspire support of anti-bullying in the school. The student behind that initiative is Graphic Communications junior Kevin Farrell from Bellingham. 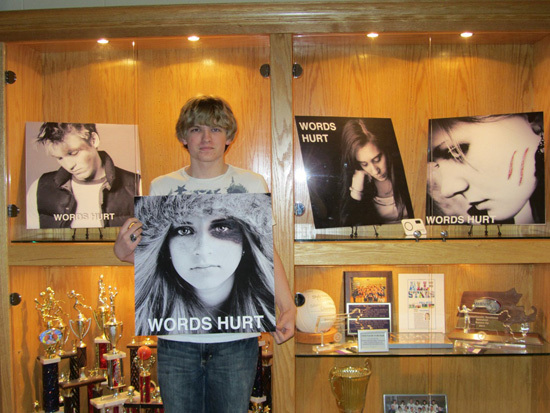 Kevin was inspired to promote positive change with a call to action against bullying and used his creativity and learned skill set to do so. His inspiration came in the saddest of forms; a news story reporting the death of a New York high school student who took his own life after a prolonged period of harassment. Kevin applied his creativity to the anti-bullying cause and began diligently working on an ad campaign in his Multimedia Communications class to have an impact on his school community. Kevin is very involved in his school community, and also in his hometown of Bellingham. He recently presented his Eagle Scout leadership service project proposal to the Bellingham Public School District School Committee. His proposed project includes transforming the courtyard at the Bellingham Middle School into an outdoor classroom.